A "smart wearable" product is an app-enabled computing device which is worn on, or otherwise attached to the body, while being used. 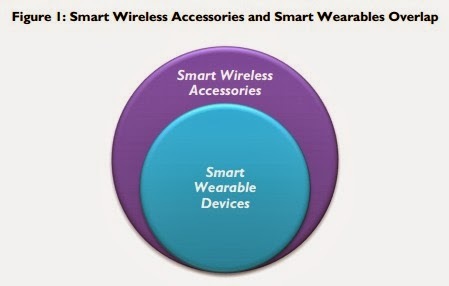 In some cases a wearable device is also considered a fashion accessory. Most wearable devices are always on and accessible at any time with a constant interaction between the user and the device. This definition covers a wide range of devices from watches to displays which can either work independently or in conjunction with an external platform -- such as the smartphone or media tablet. The outlook for wearable technology applications is very bright. New findings from a recent market study has revealed that the smart wearable device shipments -- including smart watches and smart glasses -- will approach 130 million by 2018, that's 10 times more than was forecast for 2013. The study, performed by Juniper Research, notes that market development activities in 2014 will likely add new vendor momentum and increased early-adopter user applications. Juniper’s market assessment contends that the attractiveness of wearable technology has led to the emergence of a host of players competing against each other and competition is expected to intensify. "It is worth observing that this change in adoption levels can also be attributable to heightened consumer awareness on wearable technology and a better visibility of product adoption, especially in the smart watch segment," said Nitin Bhas, senior analyst at Juniper Research. However, with wearables set to become a crowded marketplace, Juniper Research believes that all these players will have a unique opportunity to take advantage of relevant and specific product categories or sub segments within the overall market. Juniper anticipates that over time several changes will occur to the smart wearable device market, partly as a result of developments in the software applications model and embedded cellular connectivity. Revenue may be generated for companies, for example Fitbit and FiLIP, involved in the market through subscription to a service which is facilitated by the smart wearable device or through commission for a service rendered by virtue of the device. For example, FiLIP is an FCC approved app-based communication watch for children which combines GPS, Wi-Fi and cellular capabilities to keep parents and kids connected via two way voice calling, messaging and location functionality. The company's business model includes an up-front device purchase and an on-going monthly service fee. Smart wearable device vendors need to address key hurdles and critical issues from a social and technological perspective to achieve mass adoption. Significant opportunities will arise for software application developers – across the health, fitness, sports and communications segments.